In a bowl combine egg, salt, and pepper. Add turkey and breadcrumbs; mix well. Shape the chicken mixture into four 3/4-inch-thick patties. In a large nonstick skillet, cook patties over medium heat in hot oil for 10 minutes, turning once halfway through cooking time or until an instant-read thermometer inserted into the thickest part of the burger registers 165 degrees F . Brush patties on each side with jalapeno jelly or barbecue sauce. Cook 1 minute more on each side to glaze. 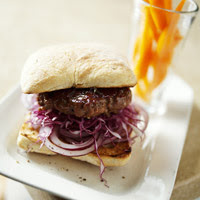 To assemble, place cabbage and red onion on bottom of rolls and top with meat. Makes 4 servings. Place patties on the unheated rack of a broiler pan. Broil 4 to 5 inches from the heat for 10 minutes, turning once halfway through cooking time or until an instant-read thermometer inserted into the thickest part of the burger registers 165 degree F. Brush patties on each side with jalapeno jelly or barbecue sauce. Cook 1 minute more on each side to glaze. Calories 453, Total Fat 15 g, Saturated Fat 3 g, Monounsaturated Fat 5 g, Polyunsaturated Fat 4 g, Cholesterol 58 mg, Sodium 853 mg, Carbohydrate 48 g, Total Sugar 12 g, Fiber 2 g, Protein 31 g. Daily Values: Vitamin C 6%, Calcium 12%, Iron 20%. This entry was posted on 9:16 PM and is filed under Turkey . You can follow any responses to this entry through the RSS 2.0 feed. You can leave a response, or trackback from your own site.